I love teaming up plants, and terracotta figures. And that's what I do here. You'll see ferns, Dracaena, spider plant and foliage (that turns purple at cooler temperatures) in the picture. Next, accommodated the frog and the tortoise planters to complete the picture. These Terracotta figures are my favourites too and I love experimenting with them in my garden. Your garden corner looks cool!! Another nice arrangement! I think that's a coleus. Did you meant for the frog to hide under the plant? Cool! @Green thumb: Thanks, I am glad you liked it...terracotta is such a blessing, you find a wide variety now. I like this garden nook. It wouldn't be the same without Mr.Frog. @Tatyana: oh yes! I totally agree. Thanks for stopping by. @Stephanie: Yeah, it's a perilla...easily confused with coleus since it's so colorful and showy. Hi there. Nice containers. And the blue ceramics in your previous posts are beautiful. Always nice to discover another balcony gardener. Keep writing and drop by for a visit when you have a minute. 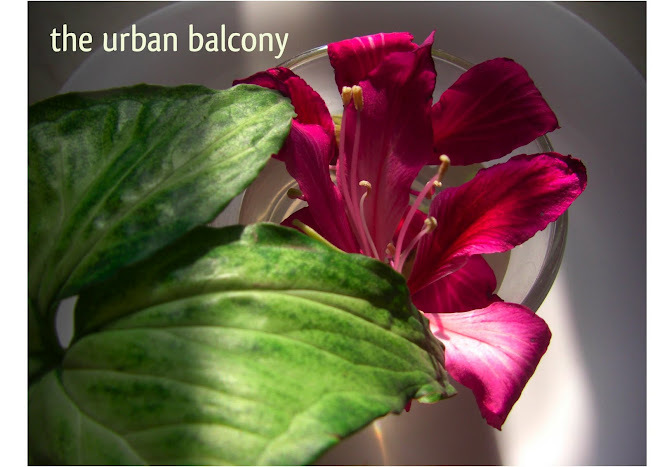 @balcony gardener: thanks for stopping by...I'm hooked to your site now. hey there, lovely urban jungle you have it going here, love that colorful critter of yours. Added you to my blog roll. Nice blog. I look forward to reading more. @Sreelu: Thanks for adding me to your blog roll. I'm glad you enjoy my posts. @Switch it: Thanks for stopping by. See you around. I love the combination of plants and terracotta. Very nice. Seed that takes about an year to sprout. Fresh out of my garden - lemon grass!